Republicans and Democrats have always been divided in regards to government’s role in business. Recently their divide has halted funding to the Export-Import Bank, an 81-year-old independent financial agency. The bank operates to provide loans, subsidies, and export-credit guarantees to foreign and domestic companies who are interested in American products. In 2014 the bank created $27.4 billion dollars in exports and maintained 164,000 domestic jobs. Boeing, General Electric and Caterpillar are among the largest recipients of funds. Veronique de Rugy and Diane Katz at the Mercatus Center at George Mason University have scrutinized the bank for providing “corporate welfare” to the Boeing conglomerate. The Mercatus Center is a project funded by the Koch Family Foundation—an opponent of the Export-Import bank. Additionally, they claimed that the bank provides funds to “[five] of the top 10 [foreign] buyers [being] involved in the exploration, development, and production of oil or natural gas” (de Rugy, Katz 1), implying that these companies are in no need of government financing. It was the Conservative House Republicans who blocked the vote in July 2015 to renew funding for the bank, claiming that the funds go to companies like GE who can fund their own exports. Consequently a new General Electric plant in Wisconsin has shut down, being forced to relocate to Canada—moving over 300 American jobs across the border. Democrats and supportive Republicans are disappointed because funding of the Export-Import Bank would have kept those jobs in the U.S. The underlying concern is the government’s ability to intervene in corporation’s affairs. 90% of the loans provided by the Export-Import Bank goes to small businesses that account for 40% of exports of those supported by the agency. Without this bank American exports would consist of large corporations dominating the smaller competition. FirmGreen Inc., a renewable energy company based in Newport Beach, California with 11 employees supports funding of the Export-Import Bank because the bank provides export security enabling this small company to safely export its products. FirmGreen Inc. is a small exporter of Boeing. Consequently Boeing has been scrutinized because of their indirect acquisition of funds from the Export-Import Bank, despite being able to fund exports themselves. Until a decision is made, lobbyists and Political Action Committees (PACs), such as Boeing, will be storming Capitol Hill to influence the government in their favor. In a purely capitalist society only the largest corporations would survive and there would be no need for the Export-Import Bank. This means jobs would shift over seas as a consequence of the high labor costs in the U.S.—putting Americans out of work. Contrary to what many believe we do not live in a purely capitalist society therefore the Republicans and Democrats need to put their differences aside and compromise in order to promote the “American Dream” and ensure the prosperity of the American people. 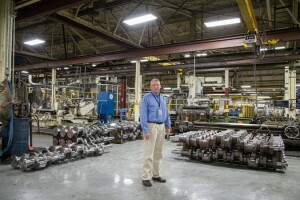 Jim Flemming: Manager of the new General Electric Plant in Wisconsin being forced to shut down.